Dissatisfied with your smile? Porcelain veneers are offered by Dr. Brandon Del Toro as an advanced cosmetic treatment option of life-like material that create a natural, beautiful smile, and produce immediate results. Porcelain veneers are thin sheets of colored porcelain that cover the front, and occasionally the sides, of teeth that show when you smile. 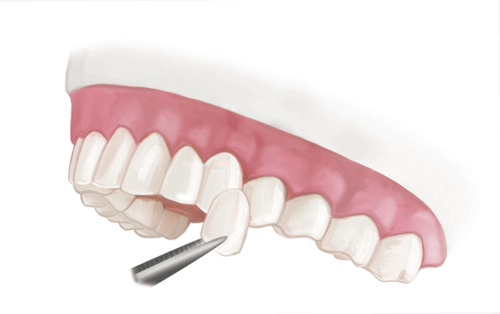 There are multiple types of materials used in creating porcelain veneers. Originally, veneers required a complex process involving a powder mixed with distilled water to form a paste. A technician would then apply it to a model made from the impression of the patient’s teeth. The recent changes in this process involving porcelain altered the cosmetic dental world by presenting an injection-molded porcelain with great strength and excellent esthetics, allowing technicians to wax the full shape of the tooth, similar to a gold crown. 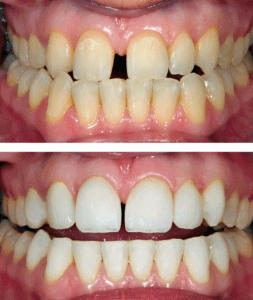 The improved strength and ease of use of this new process immediately increased the popularity of porcelain veneers. Modern technological advances in the strength of feldspathic porcelains have ushered in the latest trend of very little or no-prep tooth preparation. A technician can fabricate an extremely thin veneer, allowing us to change your smile in countless cases with little or no tooth structure removal. Regardless of the material that is used for your porcelain veneers, Dr. Del Toro places meticulous attention to the temporaries that are positioned on your teeth while your permanent veneers are being completed. These are your samples and we want to guarantee that you are pleased with them before your final veneers are ready. Many people are tired of having misaligned or crooked teeth, but not interested in spending years in braces. Through the process of porcelain veneers at Paris Family Dental, you can achieve a straight and capturing smile in a very short time. Porcelain veneers can be fitted over a patient’s existing teeth and may require only the most conservative preparations. 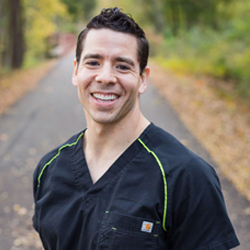 Dr. Del Toro has used this and other cosmetic techniques to help numerous patients attain dependable and impressive results, and he can also help you! Call us today at (903) 785-7671 and schedule a consultation to see if this technology of porcelain veneers is right for you!